This was one of the richest, happiest and most entertaining concerts I've ever been to. Like most of the 7000 or 8000 people there, at a vinyard under the stars on a warm summer night, I was overwhelmed by the presence of the man and the professionalism and empathy of the band. It's difficult to write a professional review or commentary (I'm a journalist) because of the impact of the man, the weight of his history, his openness and honesty on stage and in song. 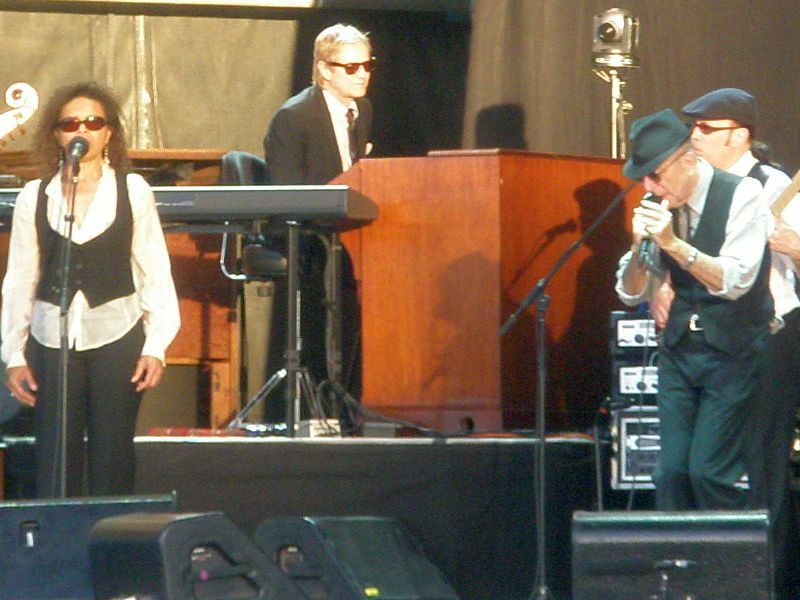 Ranking the impact of entertainers or concerts may be odious, but here is mine: Dylan 1966 (Perth), Cohen 2009 (Perth), Roger Waters 2007 (Perth), Cohen 1976 (London). Last night Cohen said: "This is my first time on stage for many years. I was 60 when I last toured, just a kid with a crazy dream . . . " and "I've done a lot of reading into various religions, but I found that cheerfulness keeps getting in the way." Two less happy comments: The backing singers were superb, but a little intrusive. In hindsight, I think they are on the first album also. And, just before the halftime break the man courteously and humbly introduced every member of his band with some supportive commentary. Then he did it all again, almost word-for-word, just before his last song. I think the memory of Cohen skipping off the stage into the evening dark after his last song will stay with me forever. I've just realised that I haven't listed Hallelujah in my setlist above. I can't remember when in last night's concert that he sang it. But he sang it. The song that has kept coming back to me all day has been Democracy. A cautious welcome of necessary change, I'd say. Jarkko - could you transfer this thread to its correct place? Yes, I know in Australia it's summer, but this thread is headed 2008, folks! Well, I made it to the concert - the trip was so worth it. I'm still on a high! One of the high spots of the Sandalford Perth concert, according to a male friend of mine, was when he had to visit the dunny and all the blokes in there were belting out "Hallelujah, hallelujah"! It is amazing that he could continue for over 3 hours and never miss a beat. I wanted to take him home ... for keeps! Truly, a once in a lifetime event for me. How wonderful if he came back to Perth one day. I think that may be too much to ask. Some photos from the concert - not as professional as those elsewhere and I haven't figured out how to separate them from the rest of my Flickr stuff - but have a look anyway. AS the security guard searched my esky and removed the Alfoil covering my cheese and biscuits, I wondered if the whole security thing had gone too far. 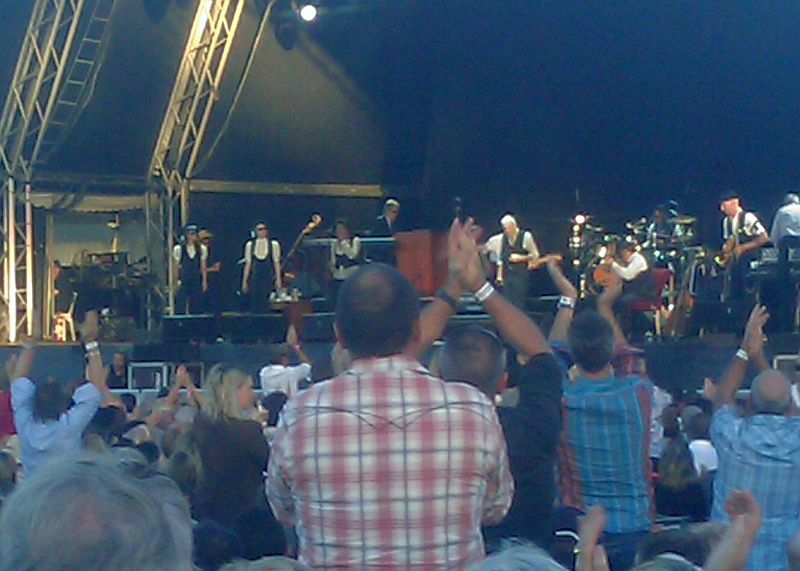 After all, it was hardly the Big Day Out, just a concert for what you might politely call the older generation. 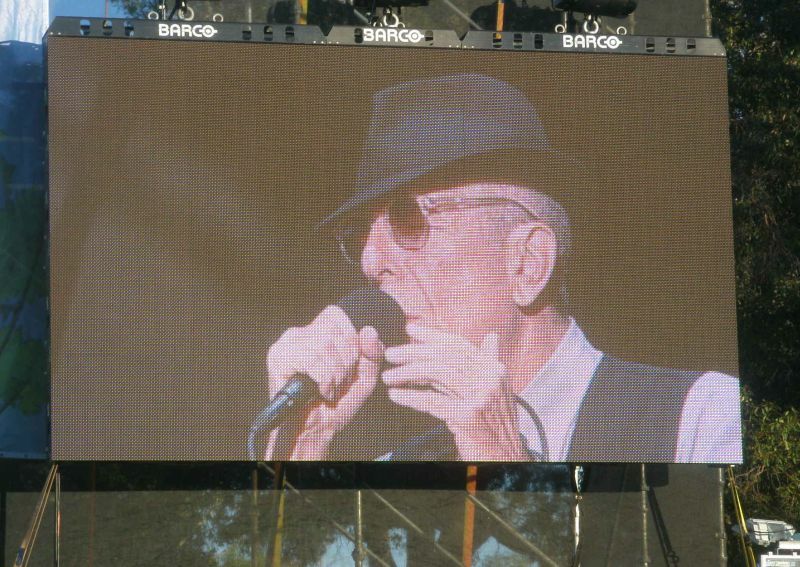 Leonard Cohen, at 74, had drawn a sell-out but sedate crowd of mainly ageing baby boomers to a local winery for a nostalgic musical evening under the stars. I was curious as to what our security man was expecting to find lurking amongst the savoury snacks – ecstasy, cocaine, or maybe something worse, some wine glasses or (shudder) contraband alcohol. He needn’t have worried. The admission tickets were explicit enough: no BYO, no glass. While we would have preferred to have brought our own tipples of choice, and to have imbibed from our own glasses rather than from cans and the flimsy, leaky plastic wine cups that were supplied, we were content to go along with it. Safety had to be paramount. Or did it? The irony of it was soon apparent. Queuing up to buy our captive-market drinks I noticed that not only could you buy wine in glass bottles, but there was also beer available in glass stubbies. Hello? Wasn’t this a glass-free zone? But it didn’t end there. Having reached the front of the queue to get the provisions for our group of eight, I asked for one bottle of the house wine and four beers, only to be told I could only have one or the other. Hadn’t I read the sign? This venue adopted a policy of responsible service of alcohol, I was told. So did all eight of us have to line-up? The helpful bar attendant suggested I buy the beers, dispose of them, and then join the queue again. They would then let me buy the wine. Oh well, when in Rome. Still, there was something a little pointless about this sort of charade. I accept that there is a public interest in guarding against binge drinking at public functions, even when the preponderance of the crowd is into its fifth or sixth decade, but the system was so obviously tokenistic and exploitable, that I wondered what was likely to be achieved. And so we sat down with our responsibly served drinks (and our security-cleared snacks) and took turns to queue up for our spartan refreshments ration during the course of the evening. Is this the way of the future? Are concerts like this about to become like airports with metal detectors, explosive-substance and quarantine checks, as well as sniffer dogs? I’m hardly suggesting that the younger generation has a mortgage on bad behaviour. Far from it. But it does seem to me that the sort of restrictions that the public is asked to endure these days in the name of safety and security has gone beyond the bounds of common sense. Airports, fair enough. But Leonard Cohen concerts? I read Tom Percy's article in the Sunday Times. I have to say there was a distinct aroma of marijuana drifting around! And there was at least one person affected by something stronger - getting on everyone else's nerves! Nevertheless, a magical concert - I did it without food or drink (H2O excepted), too rapt in the star. "I saw just as many middle aged gentlemen and gentlewomen staggering around drunk as skunks by 6pm at this show as I see younger people at the big day out "